Dr. Katz is a board-certified pediatrician who graduated from UCLA Medical School in 1981. He was trained to perform circumcisions during medical school. Although he has learned 3 different methods of circumcising, he now performs all circumcisions using the Mogen shield, the method accepted by mohelim. It is the quickest, safest, and easiest method for the baby. It causes the least amount of discomfort and heals the fastest. Dr. Katz has spent several years undergoing specialized training to become a mohel. His training has included in-depth learning of the halachot (Jewish law) pertaining to bris milah, under the guidance of his chevrusa, Rabbi Chaim Mandelbaum of the Denver Community Kollel. The study involved careful and critical learning of ancient Hebrew texts, including pertinent sections of the Shulchan Aruch and its commentaries. He is well-read on the Biblical and Midrashic references to milah. 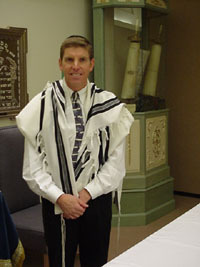 In 1998, Dr. Katz was recognized by Rabbi Paul Drazen, President of the Midwest Region of the Rabbinical Assembly of America, as a certified mohel. Dr. Katz spent the summer of 2000 in Jerusalem, apprenticing under renowned mohel Yosef HaCohen Halperin. There, he trained at Bikur Cholim Hospital in Jerusalem, attended many britot and had further one-on-one instruction from Halperin on all aspects of milah. Following this training, he received orthodox certification from Halperin as a certified mohel. Dr. Katz performs a fully kosher bris, with all the traditional brachot, and performs metzitza, an ancient practice to promote rapid healing. He considers himself a Torah-observant, shomer mitzvos Jew who is deeply involved in Yiddishkeit in his community. He and his family are members of Ahavas Yisroel and the Hebrew Educational Alliance. In addition to performing many brises, he performs 50 to 100 circumcisions per year in his medical practice, and has performed over 5,000 in his career. Dr. Katz takes great pride in serving the greater Denver area, and would be privileged to assist in your son’s bris.